With such words as these, Pope John Paul II, in his 1998 encyclical letter on Faith and Reason addressed to the bishops of the Catholic Church, calls for a renewal of metaphysics, “because I am convinced that it is the path to be taken in order to move beyond the crisis pervading large sectors of philosophy at the moment, and thus to correct certain mistaken modes of behaviour now widespread in our society.” He goes on, “Such a ground for understanding and dialogue is all the more vital nowadays, since the most pressing issues facing humanity—ecology, peace and the co-existence of different races and cultures, for instance—may possibly find a solution if there is a clear and honest collaboration between Christians and the followers of other religions and all those who, while not sharing a religious belief, have at heart the renewal of humanity” [section 104]. The encyclical itself, which exposes many of the philosophical and spiritual errors of modernity—including scientism, relativism and nihilism—does not claim to be an exposition of metaphysics. It is merely an invitation and a challenge to seek metaphysical Wisdom where she may be found; a challenge which nevertheless, coming as it does at the end of the Pope’s careful preparations for the end of one millennium and the beginning of another (the “hermeneutical key of my pontificate” as he writes in Tertio Millennio Adveniente), suggests that the rebirth of metaphysics forms part of the foundations of the new historical era that he believes is now close upon us. In one sense the dialogue of which the Pope speaks is already well underway, although it can hardly be said to have achieved a very high profile. Seyyed Hossein Nasr argued as long ago as 1968 that the degradation brought about by the prostitution of nature can only ultimately be reversed by a revitalization of theology and philosophy through metaphysical knowledge.2 Decades earlier, Ananda Coomaraswamy had exerted a strong influence on, among other Catholics, the craftsman and writer Eric Gill. Coomaraswamy, a remarkable Hindu scholar who worked as Research Fellow at the Boston Museum of Fine Arts in the 30s and 40s, was one of three writers sometimes referred to as the leaders of the “Traditionalist school” (of which Nasr is the most eminent living representative), the others being the Frenchman René Guénon and the Swiss Frithjof Schuon. Traditionalism crosses religious boundaries but (it claims) without eroding them. It insists that truth can only be attained through the practice and mediation of a religious tradition. Such forms can be transcended only from within: each revealed religion remains unique and precious in all its details, and must be accepted and practised as the condition for spiritual realization. Neither the nineteenth century nor our own possesses a philosophical language able to render metaphysical truth with precision. The attempt to find words for exact metaphysical terms has baffled the translators of St Thomas no less than of the Upanishads. There is however a difference, for while the translators of St Thomas may be presumed to have one traditional intellectual discipline at their fingertips, the translators of the Upanishads who needed to have two generally had neither. It has been said, with some justice, that they appear to have taken their philosophical language from the newspapers. The Hindu texts are not the cause of confusion, but the occasion for its display. Cardinal Henri de Lubac has devoted a long essay to the development and subsequent neglect of Pauline tripartite anthropology (see 1 Thess. 5:23) in the Christian West7. In the first part of this he establishes that St Paul’s references to this anthropology have deep roots in Scripture as well as in human experience. They were not simply imported from an alien Greek philosophy (de Lubac notes the existence of “Plato phobia” among many Christian scholars, especially in the modern period). But the term for “spirit” (pneuma) remains deliberately ambiguous in Paul. On the one hand it may refer to the Holy Spirit or divine life implanted in man by baptism; on the other, it may refer to a part of man, and specifically to that “breath of life” which God breathed into his nostrils at the very beginning (Gen. 2:7). It becomes clear as he proceeds that we are talking of the “highest point of the soul,” and that the ambiguity in question is precisely due to the paradoxical relationship of nature to grace in our human destiny.8 We are created to share in the life of God, but we are not compelled to do so: we can attain that life only through the exercise of freedom. De Lubac, at any rate, does not judge the decision of 870 worthy of mention, but sees the tripartite tradition continuing without interruption right through the early Scholastic period. In St Thomas, the distinction takes a slightly different form: that between action and contemplation, or the moral and the mystical life, or ratio and intellectus. It re-emerges fully in the Renaissance with Nicholas of Cusa and Ficino. Despite the triumph of the new Cartesian dualism in the universities, the authentic Christian tradition shines through in a continuous chain of authors up to and beyond Paul Claudel (who speaks of “this sacred point in us that says Pater noster”). How could it not, when the experience of every spiritual master confirms the existence in us of a place where we encounter God—the spirit, or “soul of the soul”? Does all this involve the literal identification of the creature’s substantial being with God? Certainly not. The created being as such remains a created being, and never ‘becomes’ the Creator… Far from effacing the creature, deification alone makes it possible for it to exist in its integral truth. If deification were equivalent to a negation of the creature, it would be a sheer contradiction, since to negate the creature is to negate the creative Will of God and therefore God himself. Deification is, to the contrary, the only possible affirmation of the creature [pp.130-40]. Thus is the distinction between Christianity and Buddhism clearly drawn, but in such a way that the truth within Buddhism is fully integrated. I have suggested that there is considerable scope for agreement between Catholic and non-Catholic Traditionalist; that is to say, agreement not just on the need for metaphysics, but to some extent on metaphysical doctrine itself, and even on its implications for cosmology and anthropology. But how far can this agreement extend before it runs aground on the Christian claim that Christ alone saves, let alone the claim that outside the Church there is no salvation? For Schuon, such dogmas belong to the “human margin”; in fact, not just Christianity but each religious tradition has a perfectly valid claim to be unique and central, superior to all others. Here, in essence, is the basis for Schuon’s doctrine of the “transcendent unity of religions” (the title of his first book, so admired by T.S. Eliot). Balthasar regards Eckhart’s successor John Ruysbroeck as having successfully purified his thought of all these tendencies, and in particular the tendency to separate the Trinitarian process from a dark primal Ground or Ungrund (which is Christianity’s closest approach to Vedantic and Islamic mysticism). For Ruysbroeck it is always the Father, not a “Godhead,” who is the “unilluminable primal Ground” of the divine Unity, “utterly light, manifest to itself, in the reciprocal love that is effulgent in the Son.” “The Son and the Spirit ‘flow back’ into the Father: this both the self-transcendence of the Persons into the simple identity of essence and the highest bliss of love of the Persons, who are perfected as such in this very self-transcendence. Thus God remains eternal event, yet without temporal becoming” [T-D, V, p. 459]. “Looking into his own ground,” Balthasar writes, Ruysbroeck “sees beyond it into the eternal I, which for man is both the source of his own I as well as his eternal Thou, and in the final analysis this is because the eternal I is already in itself I and Thou in the unity of the Holy Spirit” [GL, V, p. 70]. The encounter with God in this Place is a nuptial encounter, a spiritual marriage. Thus Ruysbroeck integrates the feminine, and the creature, in a way that Eckhart fails to do. Even if we assume there is more to Eckhart than simple heresy—and even if we go further than Balthasar does in recognizing the validity of his metaphysical insight—it remains true for those of us who lack Eckhart’s evident moral purity that to neglect the fact that we are still creatures would be to risk falling into Luciferian intellectual pride. This is surely the spiritual danger, the “final temptation,” that lies in wait for Traditionalism when it separates metaphysics too self-confidently from theology, in effect dispensing with the humble submission to revealed truth which is proper to the creature as such. It should be remembered that Lucifer—that purest and highest of created intellectual substances—was, and knew himself to be, an Angel of light.21 Humble faith, on the other hand, is a sure path that leads through hope to love, and in love to the most complete and active participation in divine knowledge, through the indwelling grace of the Holy Spirit. In this way theology, or at least authentic theology—an expression of what Balthasar calls the “esotericism of the saints”—will always overtake metaphysics. It is along these lines that Balthasar intends to “secure for gnosis the place which belongs to it in virtue of its outstanding importance and certainty” [GL, I, p. 136]. Pauline and Alexandrian gnosis (which must be distinguished from the heresies which claimed that title) is not merely a “preamble” to faith, but “the interior understanding of faith, the insight into the mystery of faith itself.” In the interior appropriation of faith, its content unfolds before the “spiritual senses.” Thus the gnostic Christian “does not outgrow the proclamation of the Church, but in the kerygma he finds, revealing himself, the Logos, who, in the most comprehensive sense, ‘enlightens’ the believer ever more clearly and, indeed, draws him, as John was drawn, to his breast ever more intimately and unites him interiorly with himself” [GL, I, p. 137]—that is, on the Cross and in the Resurrection. Ultimately it is only love that enables the spiritual senses to blossom in this way. “Love is the creative power of God himself which has been infused into man by virtue of God’s Incarnation. This is why, in the light of the divine ideas, love can read the world of forms and, in particular, man correctly” [GL, I, p. 424]. So Balthasar can say (in the same passage) that it is in love for his neighbour that the Christian “definitively receives his Christian senses, which, of course, are none other than his bodily senses, but these senses in so far as they have been formed according to the form of Christ” and the form of Christ is the form of love. The passage I have just quoted prepares the way for much in Balthasar’s later series, Theo-Drama, concerning the mediation of divine Glory by the feminine—as does his section on Vladimir Solovyev, whom he praises for having successfully synthesized and purified the whole history of Western Sophiology: he “integrates gnosis into Christianity” [GL, III, p. 285]. But what I want to concentrate upon here is the way in the second series Balthasar develops the idea of (feminine) receptivity as a function of personal relationship and communion at every level, including the divine, and as an intrinsic part of his account of divine and human freedom— especially the freedom of God to create, and the freedom of man to choose eternal damnation (thus raising two of the most fundamental questions for Christian esotericism). The distinction is a function of the “otherness” of the divine Persons one from another, within the self-same nature and unity of love. This intra-Trinitarian “distance” (the Son is not the Father or the Spirit) provides Balthasar with the key to overcoming the cosmological problem noted by the (Orthodox) Traditionalist author Philip Sherrard: the conventional interpretation of creatio ex nihilo, which sets up the created world as an “other”—and virtually a rival—to God.23 If there is this distance within God, because God is a Trinity, then there is a “space” within God for the act of creation, which takes place ab intra, not ad extra (to use Sherrard’s terms). Balthasar’s focus, however, is on the implications for divine freedom. According to Schuon, “Divine freedom means that God is free not to create a particular world; it cannot mean that He is free not to create at all.”24 For both St Thomas and for Balthasar, of course, the creation must be a free act on God’s part, simply because its Existence is distinct from its Essence. It cannot be “necessary being.”25 But the creation is also not required even as an expression of God’s goodness, because the need of goodness to communicate itself (the old Platonic principle) is forever already satisfied in the generation of the Son by the Father. In the very last pages of Theo-Drama, Balthasar confronts the question, “What does God gain from the world?” This connects two of his major themes: not only that of God’s freedom in creating, but also the relationship of God’s freedom to that of man: in particular, the possibility that some creatures may through the use of their freedom be damned forever and therefore lost to God. The question then becomes: what does God lose in losing man? Balthasar had earlier written a controversial book entitled Dare We Hope (That All May be Saved)? arguing that we may indeed so hope, both on the basis of Scripture and on the basis of visions and insights granted to the mystics. Schuon, of course, regards the doctrine of an eternal hell as pertaining to “exoteric” truth, not to esotericism, because the eternity of such a state cannot be located on the same level of reality as the eternity of God.27 While Balthasar does not question the doctrine of hell, he stresses the defeat for God that the damnation of any person would in fact represent, and sees the separation of the sinner from God as encompassed and contained by the separation of Son from Father in the abandonment of the Cross. The otherness of the divine Persons from each other within the Trinitarian Act, which is the “result” of their unlimited self-giving, is the basis for the free act of creation (since if “otherness” from God is founded in the divine nature, then God is eternally free to create something that is genuinely other than himself without its having to be impossibly “outside”). It is also the basis for the redemption of that creation once it has fallen through the misuse of its own freedom into the depths of sin. If Balthasar is right, what Christians have to say is not something less than Vedanta or Sufism, but in crucial ways more. Christianity is unique, and cannot be assimilated to the transcendental unity of religions, in that it does not reveal merely the relationship of the One to the Many or the Absolute to the world, but tells us something new about the relationship of the One to Itself. If this is so, then the divine Fatherhood to which Christianity bears witness is a reality that goes beyond any “fatherhood” belonging to the Absolute per se—for this is already revealed in the various religions and in the Intellect of man. The divine Sonship, similarly, is more than any “natural” deiformity of the human image apparent to the eyes of Intellect when contemplating the form of man and his place in the creation. Finally, then, the “deification” of which Christian masters speak has to be more than the realization of a universal truth (that in essence we are already one with God). It is the accomplishment or making true of something that was not, indeed could not, have been true “before” the Incarnation; a sharing in the life of the Absolute. This is not, however, simply to resurrect the old distinction between “natural” and “supernatural” or “revealed” religion—which would not allow for any element of supernatural revelation outside of Christianity. The true situation may be closer to that suggested by Romano Guardini, when he wrote: “Perhaps Christ had not only one precursor, John, last of the prophets, but three: John the Baptist for the Chosen People, Socrates from the heart of antiquity, and Buddha, who spoke the ultimate word in Eastern religious cognition.”28 Even Balthasar, whose at times harsh view of Asian religions (and Platonism) may have owed something to the intensity of his lifelong struggle with European Idealism, wrote towards the end of his life concerning the encounter with Asia: “The question is: does selflessness mean emptiness or Trinitarian love. The dialogue is possible.”29 Certainly Love—the Holy Spirit—is omni-present in the religions, “blowing where it wills,” and saving multitudes by making them invisibly a part of the Catholic Church. Yet Balthasar would no doubt stress that without the event of the Incarnation this would not have been the case: love is only possible in view of the Incarnation. There is a sense in which much of what is taught by the other religions is what would have been the case if Christianity had not been true: if man had not in fact been created with only one, supernatural destiny in Christ. As long as we do not know that God is a Trinity, and that we have been created in order to participate in the eternal love of the divine Persons (these being truths that are revealed in Christ), we have to project a very different kind of future for ourselves: a future very like Nirvana. Balthasar therefore believes that “the Christians of today, living in a night which is deeper than that of the later Middle Ages, are given the task of performing the act of affirming Being, unperturbed by the darkness and the distortion, in a way that is vicarious and representative for all humanity: an act which is at first theological, but which contains within itself the whole dimension of the metaphysical act of the affirmation of Being” [GL, V, 648, my emphasis]. A renewed metaphysical Catholicism has a place both for intellectual intuition and for the language of symbolism which has been disastrously neglected since the age of the cathedrals. At the same time, the difference between Christianity and the other religions is irreducible. “It is not that an eternally present cosmic law is now brought to consciousness in a new way by Christ; rather, out of the freedom of God’s love a mode of salvation is created by which all is safeguarded in God” [GL, I, p. 507, my emphasis]. The “Christian is called to be the guardian of metaphysics for our time” [GL, I, p. 656]. On the face of it, what could seem more absurd? In the last few centuries, and particularly in the last fifty years, Christians have become the least metaphysical people on earth. It was Christianity that opened the door to modernity, which is virtually founded on the destruction of metaphysics. On the other hand, does not this very fact imply the role that Balthasar gives Christianity, for only something quite unique among world religions could possess such an unprecedentedly destructive power (corruptio optimi pessima)? The reader will have to decide. One thing is clear. If such a transformation of Christians into “guardians of metaphysics” on a world scale is to take place—or even a much less ambitious recovery of a sense of the supernatural, and thus of the true meaning of their own sacraments and liturgy—Christians must look to the deepest springs of their tradition. Like Borella and Balthasar, they must become aware both of its distinctive character, as the revelation of a mystery within God, a “mystery hidden from all ages” (1 Cor. 2:7), the mystery of Christ—and also, increasingly, of all the elements of universal truth in its manifold symbolic and intellectual expressions, which Christian theology seeks (successfully or unsuccessfully) to integrate around that unique centre. 1 John Paul II, Fides et Ratio, Vatican: 1998, section 83. 2 The Encounter of Man and Nature, London: George Allen & Unwin, 1968. 3 These quotations are from B. Kelly, “Notes on the Light of the Eastern Religions,” Blackfriars, Vol. 7, 1954. 4 In such a short essay, it is not possible to develop every point at length, so the treatment will be somewhat schematic. Footnotes are intended to direct the reader to important sources where these points may be pursued. A systematic exposition of the Traditionalist viewpoint may be found in S.H. Nasr, Knowledge and the Sacred (Gifford Lectures), Edinburgh University Press, 1981. 5 For example, H. Corbin, Creative Imagination in the Sufism of Ibn Arabi, Princeton University Press, 1969. See also William C. Chittick, Imaginal Worlds: Ibn al-Arabi and the problem of Religious Diversity, State University of New York Press, 1994. Unless we take account of the nature of the imagination we cannot make much sense of the way visions and apparitions convey truth, but in a form conditioned by culture and presupposition. Corbin, who was originally a Christian, is unfortunately so carried away by the attractions of the Interworld that he can no longer conceive of a material Incarnation, and thus falls into a Docetic christology. 6 E.I. Watkin, A Philosophy of Form, London: Sheed & Ward, 1950, p. 110. 7 H. de Lubac, S.J., in Theology in History, San Francisco: Ignatius Press, 1996. 8 In fact H.U. von Balthasar—who was a pupil of de Lubac’s—describes the “trichotomism” of St Irenaeus as an early attempt at formulating the relationship of nature and grace: “the call to grace and the life of grace belong to the concrete integrity of man.” The spirit is the thing in man that “comes down from above.” See The Scandal of the Incarnation: Irenaeus Against the Heresies, San Francisco: Ignatius Press, 1990, p. 94. 9 See Catechism of the Catholic Church, Para 367. 10 J. Borella, The Sense of the Supernatural, Edinburgh: T&T Clark, 1998, p. 43. 11 Like E.I. Watkin on pp. 389-90 of A Philosophy of Form, he objects to Jacques Maritain’s denial of substantial or “entitative” contact of the human soul with God, contrasting this with the statement of St John of the Cross. 13 F. Schuon, Stations of Wisdom, London: John Murray, 1961, p. 91. 14 S.H. Nasr, Knowledge and the Sacred, Edinburgh University Press, 1981, pp. 136-8. 15 F. Schuon, The Transcendent Unity of Religions, San Francisco: Harper & Row, 1975, p. xviii. 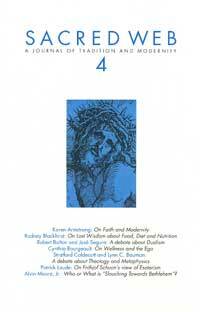 See also Kenneth Oldmeadow, “Metaphysics, Theology and Philosophy,” Sacred Web 1 (1998). 16 F. Schuon, Logic and Transcendence, New York: Harper & Row, 1975, pp. 96-109. A similar apparent lack of comprehension characterizes Schuon’s remarks (patronizing in tone) on the doctrine of Transubstantiation in the same chapter, as also in Christianity/Islam: Essays on Esoteric Ecumenism, Bloomington: World Wisdom Books, 1985, p. 56. In the latter he argues that the continued existence of the substance of bread in the eucharistic species is implied by the fact of the two natures in Christ, as if the two unities in question were somehow situated at the same level (true God/ man, true God/ bread). 18 C.F. Kelley, Meister Eckhart on Divine Knowledge, New Haven: Yale University Press, 1977, p. 37; Cyprian Smith, O.S.B., The Way of Paradox, London: Darton, Longman & Todd, 1987, p. 65; Joseph Milne, “Eckhart and the Problem of Christian Non- Dualism,” Eckhart Review, March 1993. 19 The following abbreviations will be used for texts by Hans Urs von Balthasar. GL = The Glory of the Lord: A Theological Aesthetics, Edinburgh and San Francisco: T&T Clark and Ignatius Press, 1982-91, seven volumes. T-D = Theo-Drama: Theological Dramatic Theory, San Francisco: Ignatius Press, 1988-98, five volumes. For an overview of Balthasar’s work and guidance in further study of the topics raised in the present essay, see R. Gawronski SJ, Word and Silence: Hans Urs von Balthasar and the Spiritual Encounter between East and West, Edinburgh and Grand Rapids: T&T Clark and Eerdmans, 1995. 20 The quotations from Balthasar in this paragraph come from GL, V, pp. 16-47. 21 “As St Thomas points out so clearly, the fallen spirits have lost none of their intellectual privileges; there is not the slightest obscurity in their mind… The incorruptibility of mind of the fallen angels is absolute, and to such an extent is this true, according to St Thomas, that neither God not the good Angels have ceased to communicate to them those lights which belong to the angelic nature. God still enlightens their intellects in all matters that belong to the natural state of the spirit. The only things about which they are kept in ignorance are the mysteries of divine grace. Those mysteries are communicated to the good Angels; their brightness is such that the bad spirits may be said to be in darkness.” This is from Dom Anscar Vonier, The Collected Works of Abbot Vonier, Vol. III, London: Burns Oates, 1953, pp. 181-3. 22 See G.F. O’Hanlon, The Immutability of God in the Theology of Hans Urs von Balthasar, Cambridge University Press, 1990. One might make comparisons here with the work of several important Orthodox theologians, including Sergei Bulgakov, John Zizioulas and Dmitru Staniloae. I have touched on some of the cosmological implications of this in “A Science of the Real: The Renewal of Christian Cosmology,” Communio (Fall, 1998). 23 P. Sherrard, Christianity: Lineaments of a Sacred Tradition, Brookline and Edinburgh: Holy Cross press and T&T Clark, 1998, ch. 10. Sherrard sees this interpretation as lying at the root of secularization and also of the present ecological crisis. 24 F. Schuon, Islam and the Perennial Philosophy, London: World of Islam Publishing Co., 1976, p. 173. 25 No Essence can exist unless “actualized”: that is, only the act of existing makes it something rather than nothing. Here Balthasar sides in his interpretation with the socalled “existential Thomists,” such as Etienne Gilson, for whom Existence reigns supreme, and God’s Essence is infinite precisely because it is identical with his Existence. It should be noted for the sake of further dialogue between Catholic philosophers and the representatives of “Tradition” that a more Platonic interpretation has been developed by the Catholic philosopher Josef Seifert and his colleagues at the International Academy of Philosophy, which still accepts the “real distinction” in St Thomas, but criticizes the view of the divine infinity and the exclusive priority of Existence over Essence on the grounds that not every essence is necessarily a limitation. See J. Seifert, “Essence and Existence,” Aletheia, I and I.2, University of Dallas Press, 1977. 26 Adrienne von Speyr, The World of Prayer, San Francisco: Ignatius Press, 1985, p. 42. See also H.U.von Balthasar, T-D, II, pp. 258-9. 27 F. Schuon, Understanding Islam, London: Allen & Unwin, 1963, pp. 71-83. This provides another example of the clash between Christian doctrine and Schuonian orthodoxy. Schuon’s “solution” is not open to Balthasar precisely because of the seriousness with which the latter treats not only the Gospels, where the doctrine of possible damnation is clearly taught by Christ himself, but also the Christian understanding of human deification (creaturely participation in God’s eternity through the Blessed Trinity). 28 R. Guardini, The Lord, Chicago: Regnery Gateway, 1954, p. 305. 29 Cited in Gawronski, Word and Silence, Edinburgh and Grand Rapids: T&T Clark and Eerdmans, 1995, p. 221.